Springfield Motors Buick dealership, Springfield, Oregon My wife and I were returning home from a road trip to some of the great national parks in the California Sierra Nevada range. Last Saturday morning, we crossed Willamette Pass Highway over the Oregon Cascades, and planned for lunch in the Eugene area. I spotted the sign to the Historic Downtown District of neighboring Springfield, and remembered that there was an old Buick dealership in the area. Following lunch at the The Plank, we drove a couple of blocks to the dealership, constructed in 1949 for Clarence Scherer. The dealership design incorporated features from the 1944 Buick Building Layout Guide, and the structure remains much the same 68 years later. While not as grand as some of the mid-century dealerships built in larger cities, the building has been meticulously maintained, and was named to the National Register of Historic Places in 2011. Springfield Motors is one of only about thirty remaining stand-alone Buick dealerships in the USA, and carries a large inventory of new Buicks. This was surprising, in view of the West Coast dominance by Asian and German automotive brands. The salesman with whom we talked, Victor, has been an employee since 1984, and conveys enthusiasm for Buick and the dealership's history. The dealership remains in the Scherer family, operated by Clarence's son. A glimpse into the service area revealed a superb, original 1966 Skylark GS convertible, traded in by one of Clarence's customers in 1967, and preserved ever since. I noticed right away the rarely seen 1966 GM headrest option! 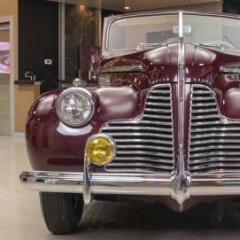 My accompanying photos show some of the enlarged photos from the showroom walls, including an image of the 1949 Roadmaster convertible that graced the showroom floor when the dealership was opened. I was particularly interested in the image of a 1949 Buick sedanette and a 1959 Buick Electra, photographed when the dealership was ten years old. A glass display case is filled with Buick brochures and promotional model cars from the 1950's and early 1960's. Clarence's father, Otto, opened a Buick dealership in Palmyra, Wisconsin in 1910, and some of the showroom images are historic photos of the early Buick dealership. 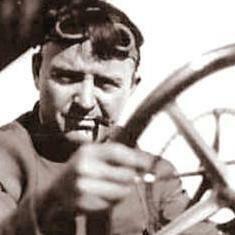 Victor eagerly pointed out the large photos of Louis Chevrolet and the early Buick Racing Team. All of this was tremendously exciting, and I offered an early suggestion regarding a celebration of the dealership's 70th anniversary in 2019. What a great opportunity to gather vintage Buicks from around the Pacific Northwest to recognize this dealership's long-term dedication to Buick. I can only hope that the folks at General Motors who have been entrusted with the Buick brand can be as passionate about Buick as the folks at Springfield Motors. Gorgeous day up here in the great "green" North, so I took the Electra out for a duplicate of the trip I made with the Wagon a few weeks ago. Up the Sea to Sky Highway that leads from Vancouver to Whistler. Halfway up to Whistler is the small town of Squamish where there Howe Sound Brewery, a great spot for local craft beer and excellent food. The trip went well and as you can see from the photos, it was a beautiful fall day. The Electra performed well, although the day was not without some drama. On the way home, the car sputtered and died while doing 60 mph... I coasted to the side of the highway and partially blocked the inside lane. As I was stalled out on the hill, there was no pushing it off the road, but luckily a buddy in his convertible Mini Cooper was able to stop behind me and there was good sight lines along the road so folks easily see me in time to move over. I could not restart the car, and every time I tried, the car would run rough for a few seconds and die again. Given the spot I was in, I called a tow truck and went back to fill in my buddy on what was going on. It really felt like I was out of gas (but had over a half tank). After about 10min of sitting there however, I was able to get the car started again and off I went gingerly. Cancelled the tow truck and made it home without further incident. Weird. I'll put the fuel filter to see if it has clogged up, but could high speeds down the curvy road contributed to the fuel starvation? Your pictures are awesome Doug! When I see pictures of the western parts of this land I often wonder" What did early settlers think when these areas were first observed?" As to your power loss, I am thinking water in the gas. However, this requires an assumption that the vehicle may have been left to sit a few weeks with less than a full tank of gas. 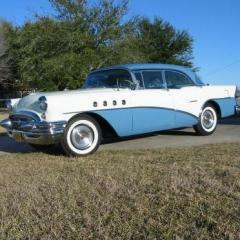 BTW, This one deserves to be in the Favorite pictures of my Post war Buick! Nice day down here in central Texas. Put the carb back on the car after a rebuild and went for a ride among the cattle and horse ranches. Ended up at a distillary that my wife like and bought her some Prickly Pear Moonshine. Car ran better then it ever has in the 2 or 3 years I have owned it. Thanks very much John, I always appreciate your insight. The car does sit a bit, so it's possible there is some water in the fuel, however it was very close to full and I use only non-ethanol fuel. The road is quite curvy with a lot of grade change, and I may have been pushing it a bit in sections to pass slower vehicles. At the point the car stalled, there would have been 1/2 tank so I'm leaning to some fuel sloshing around in the tank and sending a small piece of debris through. In this part of the world, the mountains basically come right out of the ocean, so it definitely would have been intimidating for settlers. Just building roads to these areas is relatively recent. Where I drove to used to only be accessible by ferry until the late 50s or so, and there are still portions of the mainland that can only be accessed by ferry. That chunk of granite posing behind my car is called "the Stawamus Chief" a popular hiking and climbing area being less than an hour from Vancouver. Here's a picture of the Chief from a different perspective, and you can really understand why it's named "the Chief". 53 convertible Flexing chassis ,cause for concern? Sunday October 29, 2017: Some odds and ends Installed the hand accelerator pull knob. It was hopelessly rusted together, so I had to cut it just after the metal sleeve inside, then restored all the parts that show. I don't think I'm going to use it as originally intended. I'm thinking I may use it as a separate light switch to turn the Trippe lights on. But it looks nice back into its spot anyway! Windshield divider installed. I s l o w l y tightened the screws to allow the rubber to seat fully without bending anything. Installation of the kick panels: Very carefully marked all the holes while in the car and the edge of this panel aligned with the door opening nice and straight. I started by peeling off the windlace. Then set this piece just where you want it to line up. Mark the holes in the car with a punch. Pull this piece back out and I used a leather punch to punch nice clean holes for mounting. This way you don't have ragged edges. Put this aside and time to finalize the fit of the windlace. Using headliner adhesive, I gave a little "tug" downward to be sure it was seating nice and tight. Then, using the same punch I made a hole down the line. I didn't want the screws to "bunch up" the fabric when installing the panel. Bottom of the windlace. First I cut it about an inch long. Then, making a much more precise mark, ......... I peeled back the outer fabric casing to expose the inner rubber. Here you can see the final cut brings the rubber nice and flush to the floor of the car. Then I rolled the fabric over the cut and the excess lays nice and flat so I can glue it down, set it under the sill plate.. So it stays nice and straight and won't pull off. Finish marking and punching all the holes, giving the lace a little pull towards the front so when the panel drops in it all tightens up nice. I think I'm going to find more decorative screws with the nice decorative washers, but these will keep it happy for now. I know the upper end should cover the dash screw, but the dash was bent away from the car up there and when I tried to install it over that screw, the panel began to crease. Plus, the dash keeps the panel in nice and tight, so I did it this way. Have a great night! Gary Installing the rear roll-up windows tomorrow! Welcome! Always great to have another enthusiast! While posting descriptions and pictures here will certainly get you some good feedback, I would suggest an alternative. Joe P mentioned the lack of competent mechanics today for sixties cars. How do you find one? Many areas have weekly/monthly/semi-annual whatever cruise-ins, often at the local arf-and-barf (a.k.a. fast food "restaurant"), but also a local park, car dealer, etc. Attend one or more of these cruise-ins. Look at some of the sixties cars you see. Talk to the owners. Most car enthusiasts will be glad to show you their vehicle. This may give you insight as to what make and model you may prefer. Also, ask for guidance on local mechanics these folks have used. No reason why you should not be able to drive a sixties vehicle in good shape year-round. We certainly did so in the sixties!!! If you reside in an area where there is snow (or here in Missouri where the Department of Transportation is helping the Department of Energy dispose of coal residue a.k.a. cinders each winter) you should probably check the undercarriage for undercoating, and if now currently done, consider doing this. Everyone has their own favorite make, but you should pick your own. From a practical standpoint, there are probably more availability of parts for Fords and Chevies, but don't let this be your only selection criteria. Pick a vehicle YOU like. Good luck, have fun, and again........WELCOME! Jon. Our local Portland area chapter toured this dealership on Sandy Boulevard in Portland several years ago. I am told it was to be replicated by the Smithsonian Museum before it was sold & remodeled. The yellow sedan is now my son's car, and the roadster belonged to Jack & Barbara Gerstkemper at the time. Putt around or parades? I'm not a Navy man, but me thinks I saw a shot across me bow? Well we do, do some putting and parades but we also have a bunch of fun on the open road too in our stock Buicks and drive. Nothing against Modified Buicks or Modifieds in general, heck I own one with a bow tie on the front . . . but I digress. Well here are three stock Buicks in Baraboo, Wisconsin on the PWD After Tour this past summer. Each had a bunch of fun at the BCA National Meet along with a bunch of Buick cars and trucks and wonderful Buick Folks I don't have pictures of. The 1937 is by my Google Maps calculation 825 miles away from home, did another 300 or so in Wisconsin so that's 825 + 825 +~300 = 1950 miles The 1924 is from Rhinelander and did at least 300 miles of touring. The 1923 circled Lake Michigan and did 1495 miles total. Don't underestimate the road worthiness (and fun) of a well tuned stock Buick or the really nice people who drive them. 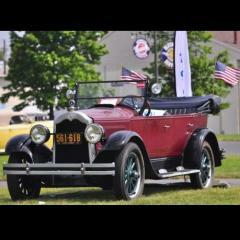 Fix up that '31 and come have some fun with us, stock or modified. I'd call it the Mr. Earl Retirement fund collection! Here's the original "in home" charger or maybe it's something from Frankenstein's lab. It will be restored as well but not made operational for safety's sake. I made this valve cage from scrap 3/4" square tubing and a long bolt. Remove the castellated cage retainer nut and spring assy. Liberally lube the cage vale with 50/50 ATF & Acetone for a day or more. Remove the top nut & washer from the puller. Insert the valve stem into the bottom hole, place the heavy top washer over the stem & replace the keeper. Turn the lower nut to pull the cage assembly. Some valves may require just putting a strain on the puller for a day or more with more lube and/or heat. A different kind of tri-five with no bow tie. Later... took a closer look at the Mercury Marauder pics and it is rustier than I thought. The Plymouth would be the better buy on condition. The Mercury looks like it needs a lot of work. Could probably work as a learning exercise. Maybe you could become the next Rube Goldberg! I love to see 322’s in hot rods From a friend on the west coast and he has this Century minus the above engine for sale. Just brought in this 1918 Rauch and Lang electric for full restoration. As to where to buy, I always buy privately. Preferably an original unmodified car from a good neighborhood. 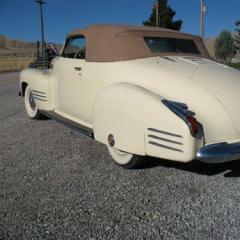 My choice would be a well maintained original car not restored. There are plenty of decent old sixties cars around. Suggest you start with a lower priced model that is simple, with a small V8 or six cylinder engine and the minimum of power accessories. I like Plymouths and Dodges, in fact all Chrysler products. But there is a lot to be said for Chevrolet and Ford, especially when it comes to getting parts and repairs. Really though, I would not turn up my nose at a good Pontiac, Olds, Buick or Mercury at the right price. There are some good buys out there especially in the less popular models like 4 door sedans. If you want a Mustang, GTO or Road Runner expect to pay through the nose. Watch the ads and see what you can find. I like to peruse the ads, and find a great deal every 3 weeks or so. There are so many I have to purposely avoid looking at the ads or I would buy another one half a dozen times a year. Probably the last run for the Electra until Spring. As if the car knew, it decided to strand me for a few minutes on the side of a busy highway with not much of a shoulder! Was able to get it restarted after 10min or so and made it home without any further problems. Not sure why it stalled, but nothing like losing power doing 60 mph on a busy, windy mountain road! Welcome, Mr. Wondergrape! Any good dedicated hobbyist is happy to help a newcomer. I don't claim to be a mechanic, and I'm well involved in the hobby; so don't feel that mechanical prowess is a requirement to owning an old car. If our furnaces break, or our television stops working, we're likely to take it to an expert. Everyone has different knowledge. Consider buying a good price guide. One well-respected guide is the price guide put out by Old Cars Weekly. Here is their annual book: https://www.oldcarsbookstore.com/2018-collector-car-price-guide Four-door sedans are the most economical body styles to buy, because many collectors favor convertibles first, then 2-door hardtops. So almost any 4-door sedan from the 1960's is likely to be a nice survivor--a older person's car now in collectors' hands--than one that had tens of thousands of dollars spent restoring it. As long as you buy from a private owner, you should be able to find very good sedans in the $5000 to $10,000 range. Problems with parts, or problems with ethanol-laced gasoline, won't stop you. A fairly common model should have no problem with parts availability. Putting an ethanol treatment in the gas with each tankful should obviate the damage from ethanol. You definitely don't want to drive an old car in the winter, because cars from the 1970's and earlier will rust badly: Your pride and joy, and your monetary investment, will be badly damaged, even ruined. So consider keeping your old car as an occasional driver, one you can enjoy and preserve for decades. If your car is kept for hobby purposes, with occasional fun jaunts for other purposes, you can get antique-car insurance from good companies such as Hagerty, J. C. Taylor, Grundy, etc., and you may find the cost is only $75 a year! You'll find this hobby to be a lot of fun! I certainly have no issues with using a 60s vintage car as a daily driver (I'm doing that myself) but understand the issues so you do this with your eyes open. If you are not doing the work yourself, you will have to find a VERY reputable mechanic who understands these cars. Depending on your location, these can be few and far between. While these cars are not complex, most "mechanics" today are only "parts changers". They plug in the scan tool and replace the part that the software says to replace. Sometimes this fixes the problem, sometimes it doesn't. None of them could diagnose their way out of a paper bag, and most have no clue about how the systems on cars actually work or how failures manifest themselves. Based on the questions I read on other forums, virtually no "mechanics" today know how to rebuild or tune a carb, how to replace points, or what a mechanical fuel pump is. Since 1960s cars are half a century old, don't expect to run into your local parts store and get a replacement part when something breaks. At best, they will need to order it, which means the car will be down for a few days. At worst, replacement parts are not available and you need to either scour the internet to find a good used one or adapt something else. 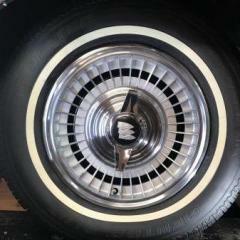 An example of this are the brake drums for the 1965-1970 Olds full size cars. They don't exist. What this ultimately means is that even if the older car is your daily driver, you need to have a backup vehicle for those times that it's down for maintenance. Most insurance companies won't write collision policies for cars this old. They don't have actuarial data on repair costs any more and so can't price that coverage. It's easier to just say no. And whether you have coverage or not, unless the car you select is extremely popular, replacement body panels are not available for crash repair. In my case, I've accumulated parts cars to harvest spares. Living on a farm makes storing them easier. Today's ethanol-laced gasoline wreaks havoc on old car fuel systems. Expect to have to replace rubber parts with modern materials if that hasn't been done already. The ethanol also causes problems with cold start (especially if the car has not been driven in several days). The fact that ethanol leans the fuel mixture also means that the carb may need to be re-jetted for best performance. Again, these points are not intended to discourage you, only to help you make an informed decision. Even if I was quite lately, work is continuing. It's not making sense to show each filler application or sanding!. The main body (rear fenders, roof, doors and trunk lid) are at 95% satisfying. I still have some improvements to do, especially at the cross panel between trunk lid and back window. We had a wonderful October month; therefore, I could do most of the surfacer job outside. Today, we said goodbye to the summertime and hello to the wintertime, the weather is getting cooler and humid. I ordered the paint for the leather; it’s water based and I have to spray it with my airbrush because it seems that water based colors cannot be sold in a rat can. The blue paint for the leather is rather darker than the original medium blue. As the outside paint is also different, I choose a blue which is in harmony with the outside color. With the white bolsters, I will give a good contrast. On the first picture, 3 leather parts at the right are ready to install, one with some chrome trim. The other parts are ready to be painted; the lower door trim panels will be done next. As you can see, I’m using quite a few leather colors; I just hope that I will have enough. The thickness is between 0.1 and 0.2 mm (0.004 to 0.008”); thicker leather cannot be used. The second picture is my leather’s stock. Dave, great stance without abandoning the stock theme. Thank You for the info regarding suspension, front end alignment and handling. The 63 I have would look great 2” lower. The reason why I won’t lower my car is I have knee and back problems that make it a challenge to get in and out. Of course, I could go the expense and have it bagged. I won’t do that because the expense is something I don’t want to pay. Looks r e a l good tome because you have it all. Great Riviera style with a mod that does not fall out of the stock theme. My Red Riviera on a nice autumn day is attached. Success strikes again ! Got the carb put back on the car this morning and the car started right away. I found it helps you if put the throttle return spring on. But it ran and after doing some minor tuning we went for a drive. Car drives like it has never driven before. Good response, not bogs, hesitation or backfiring. Idle needs some work and I have to reset the choke, but for the most part I am happy. It drives like my Riviera did. I should have done this a long time ago instead of chasing imaginary ignition gremlins. So now I have new points,. wires, cap and rotor along with coil PLUS a rebuilt carb. Cant ask for more. It is time to drive the car. I can't say enough about the Carb Kings kits. Had everything I needed to make this work. I am very happy. Took the truck out for a short drive today to put in the workshop for the winter work. When I say short I mean short, a couple of miles.. It was 37degF/ 3deg C today. What a fantastic idea for a 70th Anniversary celebration... you can count me in for that! Couple of things I don't like about the ad you posted. It is a "classic car" site which means they are probably charging a premium price. I don't like all the "rebuilt" stuff. and 10 grand is a lot for a 4 door. My impression is, you can do better. A few more thoughts on the topic. I would stick to cars from the 1967-1972 model years. 1967 was the first year for a number of federally-mandated safety features, including dual circuit brakes and collapsing steering columns. 67 was also the first model year that disc brakes were pretty much available across the model lines (though they remained pretty rare until the early 1970s). Yeah, I'm aware that some cars offered these features earlier (Caddys had the dual circuit brakes from the 1962 model year), but 67 was the first year they were mandated and available across the board. 1968 was the first year for mandated front shoulder belts (again, they were optional but rarely seen prior to that). 1969 was the first year for headrests on the front seats (and again, a rare option prior to that) and a locking steering column. 1970 was the first year for side impact beams in the doors. 1971 was the first year that the feds mandated the use of low-lead gasoline, so all 1971-later engines have hardened valve seats. I would avoid 1973-newer because that was the first model year where federal emissions requirements were really imposed. The resulting makeshift systems that automakers slapped onto their engines in those pre-computer days resulted in poor driveabiltiy, miles of complex vacuum lines under the hood, and cars that are difficult to tune if any of the emissions parts are worn or not functioning properly. 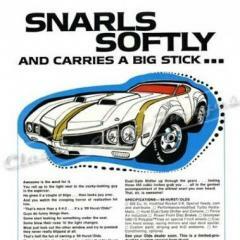 1973 was also the first year for federally mandated "buggy bumpers" to satisfy the 5 mph impact requirements. This was not an aesthetic success. Avoid the "barn find" hysteria. Not only is this a construct dreamed up by the big auction houses to drive up prices, but the absolute worst thing you can do to a car is to let it sit for years. Any one of these cars will require complete replacement of every non-metallic part in the brake and fuel systems to be safe and reliable. Avoid cars from the rust belt. It's worth your time and money to buy a solid car from the desert southwest, even if you have to pay shipping costs. Mechanical repairs are easy and relatively inexpensive. Correct rust repairs are very expensive and time consuming. There are far too many poorly repaired cars. An ad that says "no rust" usually means "no rust visible at the moment". Be wary of freshly repainted cars. I would much rather have faded original paint than shiny new repaint. The latter always begs the question "what's under that resale red?" If you don't feel qualified to evaluate a car yourself, enlist the help of an expert, even if you have to pay for them to inspect the car. These cars are half a century old. Lots of stuff has been done to them over the last 50 years, and frequently it had been done poorly or incorrectly. If you have a particular marque in mind, join the local chapter of the national club. Talk to the members, look at their cars, and ask around. Good luck. If you use a flanged finish washer rather than a regular finish washer, it's not as likely to cut into the surface of the panel when tightened. Screw Cap Covers ? or decorative washer? Wondergrape, Welcome to the forum. On this forum, the only stupid question is the one that you do not ask. I would agree that Chevy's of the 60's are probably a good starting point because of the volume of cars made and parts availability. Many of the basic brakes, engines, transmissions, suspension parts were used well into the 80's and sometimes later by GM on some models. Parts are surprisingly available. If you think you have found a model that you like and are considering do some homework and searches for any issues. AND issues for cars of that era can be region specific. Example is in the salt belt they have a tendency to rust out. 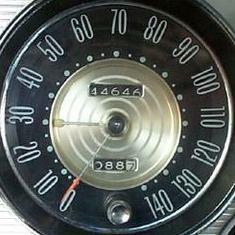 In the desert southwest the instrument dashes and interior seats, etc. will fade, crack and go bad. Basically plastic and cloth parts. On a coastal area the whole thing can rust depending on the care taken by the previous owners and how close the car lived to the ocean. Just go into this with your eyes wide open. Do as some of previous posts suggest is to post pictures and prices so we can give you fair evaluation based on the collective experience of a lot of experienced persons. When you buy the car go online and buy a FACTORY SERVICE MANUAL, not a Haynes or something else. This will be the most important book for you to understand your car and deal with issues. Hope this helps and ask all of the questions you want. Nice example of understated elegance ! Buy a new seal. Keep the old one to make sure the new one matches in design. I will leave the installation question to others. A comment was made on another thread about not underestimate the excavating work. No truer words can be spoken. I way under estimated the time to really get my site finished up. Not even Grass and flowers but just the amount of work to flatten a spot on a hill, then the drainage for the building and proper grading of the whole area. Seems all I do is get everything levelled off or graded properly, then dig it all up for something else. I put stone in for the drainage of the eves, fortunately only on one side, when a friend told me i really should use a coarser stone without the dust. So i had to dig that whole side back out, 20 ton of stone and fill it with a different type. Fortunately I just used the reclaimed stone in the driveway. I had to cut grade down in front of the garage 16 inches. That's alot of dirt to move with my small equipment. So much I now have a huge mountain of it and I filled in a large area behind my existing garage. I finally think i am seeing the light of day, which is good as my building crew hasn't showed up so I'm going to have to start framing it myself. I do have some more stone to put down but I think i have enough for the water to drain and not create such a mud pit like after the last deluge we had a few days ago. It's suppose to be 3-5 inches of rain in the next day and a half. I'll see if i have everything properly pitched. Of course the rocks have presented a bit of a challenge a well. All those you see and I buried alot of the others I found. My wife likes stone walls, so I have been stock piling them for future projects.